Reuters: U.S. economic growth will slow steadily in coming quarters after touching a four-year high in April-June, according to a Reuters poll of economists, who expect President Donald Trump’s trade war to inflict damage. Boosted in part by $1.5 trillion of tax cuts passed late last year, the U.S. economy expanded at an annualized rate of 4.1% in the second quarter, its strongest performance in nearly four years. But the latest poll of more than 100 economists taken 13-21 August showed they expect the U.S. economy to lose momentum and to end next year growing at less than half that rate. The U.S. economy was forecast to grow 3% in the current quarter and 2.7% in the next, a slight upgrade from the previous poll. But the short-term boost to growth from tax cuts was expected to wane. 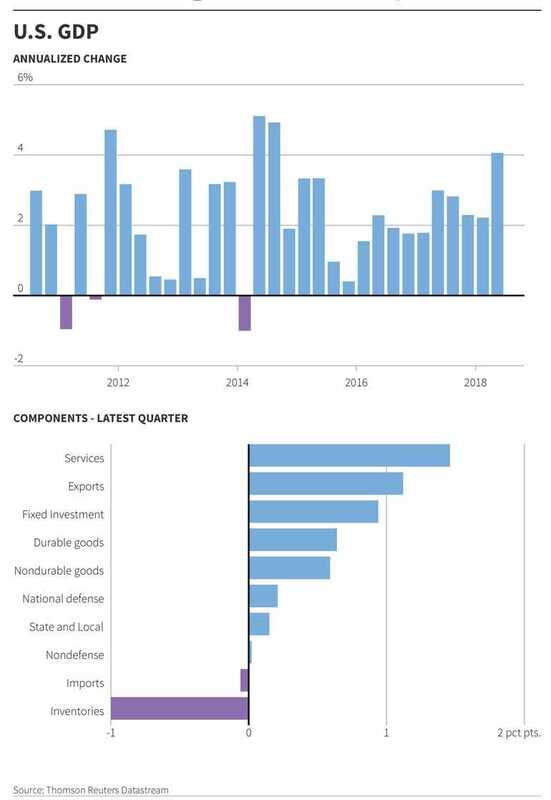 Economists trimmed their growth projections across most quarters next year leaving the outlook broadly unchanged and vulnerable to the trade conflict with China. “The trade measures taken by the U.S. so far and the retaliation by foreign governments will probably slow down the economy only marginally,” noted Philip Marey, senior U.S. strategist at Rabobank. Nearly two-thirds of 56 economists who answered an extra question said they have considered the impact of Trump’s expanding trade war in their U.S. growth predictions. That was a nearly identical proportion to a poll of economists covering the euro zone published on Wednesday. The remaining 20 said the trade dispute has had no influence on their forecasts but underscored the downside risk if trade tensions deepen. “At this time, with what we know and believe will occur, we acknowledge that risk to the outlook is to the downside with the trade disputes. That said, we have not substantially lowered our U.S. GDP growth outlook. Further deterioration and eventual performance could certainly change our outlook, however,” said Sam Bullard, senior economist at Wells Fargo. While Trump has said these trade tariffs will benefit the U.S. economy, no economist polled by Reuters shared that view. All the tariffs imposed and the retaliatory measures until now have been largely confined to Chinese industrial machinery, electronic components and other intermediate goods and has had only a limited impact on the U.S. economy. However, the next round of tariffs planned for late September are aimed at consumer products and likely to have a negative impact on the overall economy as consumer spending contributes to over two-thirds of U.S. gross domestic product. While the consensus suggests a slowdown in the world’s largest economy starting next year, only one of over 100 economists polled predicted an outright recession in 2020. The poll gave a one-in-three chance of a U.S. recession in the next two years, a slight downgrade from a 35% probability of that happening in the previous poll. But bond markets are telling a different story. The U.S. yield curve, as measured by the gap between two- and 10- year Treasury notes - is now just 23 basis points, the flattest since just before the last financial crisis. That suggests a yield curve inversion - where the spread goes negative and which has accurately predicted five of the past six recessions - is coming soon. Despite the threat from trade tensions, the Federal Reserve is still forecast to raise interest rates by 25 basis points in September and once more in December, taking the fed funds rate to 2.25 to 2.50% by the end of 2018. For next year, though, economists forecast only two rate increases compared with three suggested by the U.S. central bank’s own “dot plot” projections. Minutes released on Wednesday from the Fed’s latest policy meeting, held July 31-Aug. 1, hinted further removal of policy accommodation was likely to come “soon”, should strong data continue to support current economic projections. The dollar snapped a five-day losing streak as traders took the minutes as a signal rates will rise next month. Like economists in the latest poll, Fed officials also discussed the possible damage of trade conflict on consumer spending and business investment. “The fading impulse from fiscal policy and impacts from trade uncertainty are a 2019 story ... and the Fed will be focused on how its outlook is tracking today and how financial conditions are evolving,” noted economists at Morgan Stanley.